Let’s face it…winter is coming and with it is comes cold and flu season. One of the best places to contract bacteria and viruses is in your work environment. Often times, a person is indoors and around a lot of people whom may be getting sick. Being prepared to defend yourself from your co-workers and/or the public is essential. Warding off these germs as long as possible will make the winter months easier to manage. What are some of the ways to stay healthy and avoid the office illnesses? Wash your hands often and use hand sanitizer. It can go a long way in keeping germs away. Avoid those who are not feeling well or are sneezing and blowing their nose. Air-borne illnesses are highly contagious. Stay hydrated with lots of water. Eight to ten glasses of water a day is recommended. A person feels better when they are hydrated. If you have contracted an upper respiratory illness or the flu, staying hydrated is essential to getting over the illness faster. Limit the amount of caffeine and alcohol intake, which is hard on your adrenals and can weaken your immune system. Eat well-balanced meals and healthy lunches. Staying away from sugar will keep a person’s immune system strong. Snacks that have protein will give you more fuel to run on during the day. Don’t forget fruits and vegetables, which are loaded with antioxidants to strengthen the immune system. During lunch or breaks, get outside in the fresh air. Keep moving. There is an enormous amount of benefit from regular exercise. Even small amounts of exercise throughout the day can have a positive effect on your immune system. 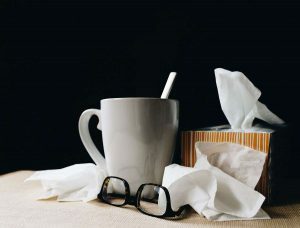 If you are sick— stay home!! The best way to reduce spreading germs to others is to stay home. Work from home if possible. If you have to come to work, isolate yourself to keep your germs from spreading to others. Don’t share…including office equipment, pens, computer keyboards, phones, etc. Do not share drinks or foods. Keep your immune system strong! Consider medicinal plants that strengthen the immune system. Some top medicine plants that are good in fighting germs include Goldenseal, Turmeric, Astragalus, Garlic, Mushrooms and Echinacea. Consider supplements that empower the immune system to fight germs including Vitamin C and Vitamin D3. Finally, take a vacation. Often business slows down over the holidays and winter months, so this is a good time to get away. Avoiding the sick environment and going to the sun is well worth the trip.